Sonos, my favorite wireless music system announced a new release today that brings some significant new capabilities to their system. The first official Android app is now available for android devices and there’s a new Sonos software upgrade that provides support for Apple AirPlay. The new Sonos Android remote control app works much like the iOS app for Apple iPhone and Apple iPad. You can control your Sonos system completely with the Android and iOS apps browsing through your music collection as well as the many online music sources available. It allows for control of multiple Sonos devices, volume etc. 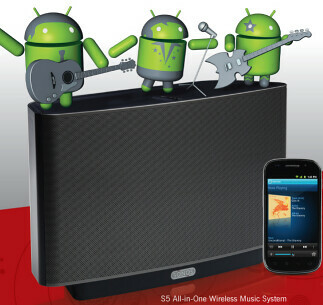 The new Android app also allows for the use of voice commands for searching through music artists, albums and tracks. The Android remote control app works on Android 2.1, 2.2, and 2.3 with support for screen sizes of HVGA 320 x 480, WVGA 480 x 800, or WVGA 480 x 854. A free download is available at the Android Market today. The Sonos iOS remote control app for iPhone, iPod Touch and the iPad also gets a free update providing fast app switching on Apple iOS 4 devices and AirPlay support (requires a free Sonos firmware update) that lets Apple AirPlay streamed music on all Sonos devices (requires Apple AirPort Express).